GK Tourism - GK Mabuhay aims to showcase the beauty of the Philippines and the Filipino as reflected in our GK communities. GK Mabuhay develops the potential of all sites to become tourist destinations because of the unique beauty of the area, and the inherent warmth and generosity of the GK residents. The Philippines, comprising of 7,107 beautiful islands, is the setting for one of the most exciting stories of change and empowerment in the world. While the Philippines is known for its beaches and other beautiful tourist destinations, it is also known for its poverty and corruption. GK Mabuhay seeks to restore pride for our country and our people by sharing the inspiring and exciting work with the poor happening in the Philippines to the rest of the world. 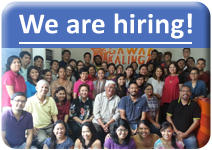 The GK Mabuhay Program welcomes local and foreign visitors to volunteer in Gawad Kalinga and experience Filipino culture by immersing in a GK community. Volunteers of this program will have the opportunity to get to know the GK Kapitbahayan (GK residents) and build houses with them, tend their farms and participate in other GK programs wherever their interest lies. If you are looking for a meaningful way to spend your vacations and holidays, the GK Mabuhay Program provides you a venue to do so. While helping GK communities, you also get to experience the local culture and discover nearby tourist spots that only locals know. By working with our caretaker teams and the Kapitbahayan and with the help of the Department of Tourism and other industry experts, we are able to design a variety of volunteer-tourism packages that makes the exciting experience of GK community life possible for people of all ages. We have a Mabuhay Adventure package for the youth which many schools, organized and informal youth groups from different countries take time to join. The package allows for the participants to immerse in the GK community (even being welcomed by the GK residents into their homes) and with opportunities for outdoor adventures in the nearby vicinity. If you wish to take your family --- or for adults even past the age of fifty --- we suggest you try the Mabuhay Bayani Package. Equally as exciting and fulfilling, it provides the simple comforts of home you can return to after days spent working with and learning from the GK community. Every year, we offer a number of GK destinations for you to choose from. With the many tourist destinations the Philippines has to offer, we can likewise arrange for other rest & recreation activities for your group. Many of those who have experienced our Mabuhay Tours always leave our care renewed and inspired! Interested to join us, contact us at 9409789 (trunkline) or at 5332217 or email us at tours@gk1world.com.